The last few weeks have likely brought some restless nights for executives of the World Poker Tour, especially Steve Lipscomb. The Founder and Chief Executive Officer of the World Poker Tour (Symbol: WPTE) has watched as tens of millions of dollars in market capitalization have evaporated in the past year. To say that the World Poker Tour is in a troubling situation right now would be an understatement - the publicly traded stock is currently going for $1.16, which gives the entire company a valuation of just $23.77 million dollars. A far cry from the "glory days", when it was worth more than a half of a billion dollars. Steve Lipscomb and the WPT are in an extremely vulnerable position right now. On May 27th, 2008, the World Poker Tour granted GSN (Game Show Network, L.L.C.) a one-time extension so that GSN could decide if they wanted to pick up the seventh season of the World Poker Tour. The original deadline was May 24th - the World Poker Tour filed an amendment to their agreement with GSN, extending the deadline to June 7th. Just the fact that GSN needed an additional two weeks to decide on whether or not they wanted to air the seventh season of the World Poker Tour is a fairly ominous sign. Apparently "High Stakes Poker" is not filming a new season, so it wouldn't be too much of a stretch to think that GSN is doing away with all of their poker programming, including the World Poker Tour. Apparently poker on GSN has not brought the influx of younger viewers that GSN had hoped for, which has made poker programming expendable. A younger demographic equates to more advertising dollars for GSN. If GSN decides not to air the seventh season of the World Poker Tour, then this will leave Steve Lipscomb scrambling to find a new deal. You can only assume that any new deal would be significantly weaker for the company compared to their current GSN deal. Everything revolves around the company having a strong television deal. Most of their revenues come from their television deal, so an additional reduction in their per-show licensing fee would obviously have a significant impact on their bottom line. They are already losing money every quarter. The development of additional revenue sources such as Club WPT and their online gaming business are obviously highly dependent on the company having a strong presence on TV. The company is on the verge of reaching penny stock status. 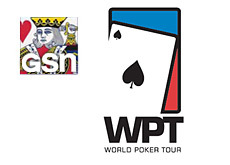 If GSN decides to not pick up the seventh season of the show, can the World Poker Tour turn things around? They do have some cash, but it won't last forever. The World Poker Tour should find out early this week if they will continuing airing their shows on GSN.